Caucasian Kuba Seichur: 18'7" x 9'10"
Size in feet18'7" x 9'10"
Differing from other rug types, Caucasian rugs are primarily produced as village productions rather than city pieces. Made from materials particular to individual tribal provinces, the rugs of the Caucasus normally display bold geometric designs in primary colors. Styles typical to the Caucasus region are Daghestan, Shirvan, Kazak and Kuba rugs. The Caucasus is a geopolitical region at the border of Europe and Asia which encompasses: Armenia, Azerbaijan, Georgia, Russia and Turkey. It is home to the Caucasus Mountains, including Europe's highest mountain: Mount Elbrus. The collapse of the Soviet Union and the consequent liberation of communication and trade links between the west and the newly independent Caucasian republics have resulted in the release onto the market of previously little-known traditional "heirloom" items, particularly flat woven covers. 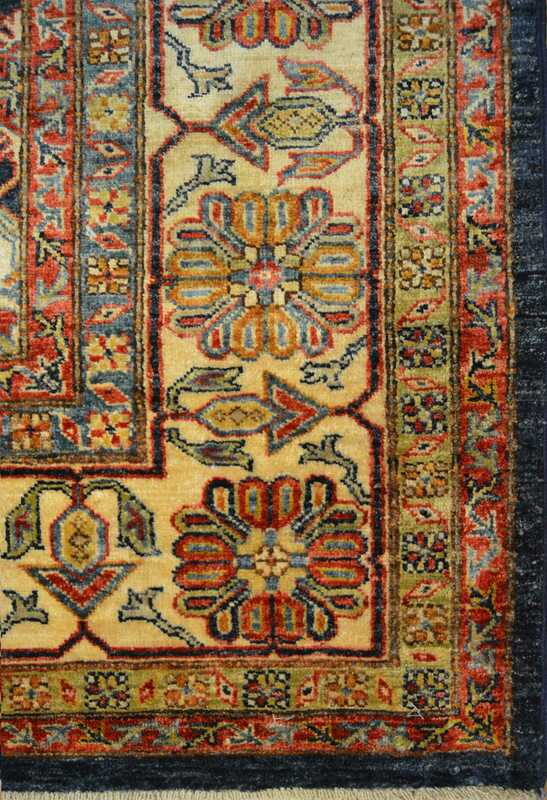 Caucasian carpets are made with symmetrical, Turkish or Ghiordes knots. 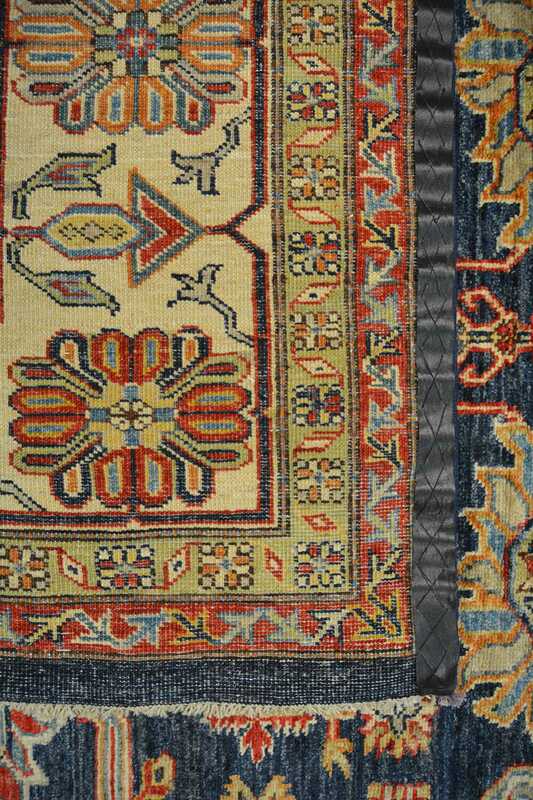 Contrary to popular belief, Kazak carpets are not necessarily from Kazakhstan but are from an area which is now Armenia. 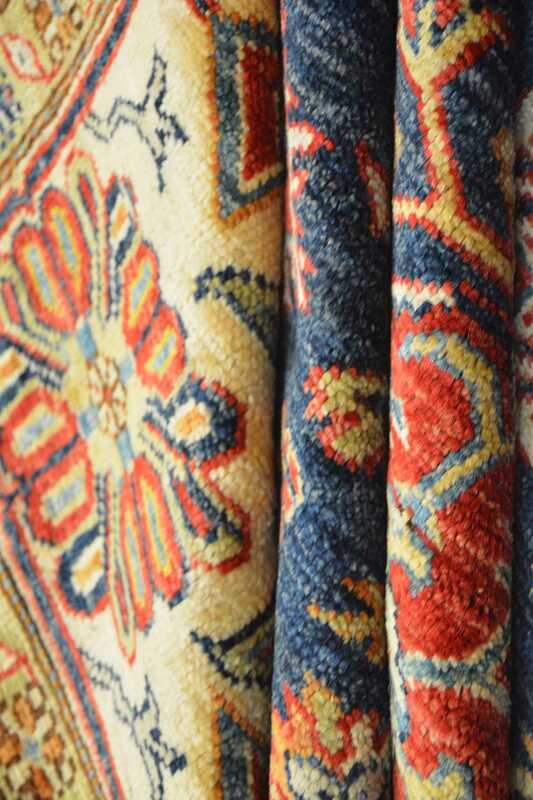 Older Caucasian Rugs and their colors are mostly made from natural materials found in tribal regions. They are generally 100% wool pile including those that are made up of warp and weft threads which are usually made from hand spun woolen yarn or goat hair. On occasion, one can find older carpets with cotton warps and wefts. Warp threads may be made of undyed light yarn in one area and dark or mixed yarn in another area. Goat hair is applied to the warp threads, but never for the pile. Weft threads are made of various colors such as: rust red, brown, blue or white. The number and colors of selvages indicate the tribal region from which the carpet pertains.